For those wanting to learn the soothing, yet addictive art of knitting, we are now offering a Learn to Knit series of classes that run over three consecutive weeks. The first class will begin with the basics - such as the knit stitch, the purl stitch, and casting on. The second class will continue with knitting and purling, but will also begin delving into how to use those two stitches together for ribbing and the seed stitch. The third class will be touch on things like increases, decreases, and simple finishing techniques. What is better than learning/perfecting techniques with the end result being a beautiful piece to show off your knitting skills to the world? Baubles was designed by knitting wunderkind Andrea Mowry and includes two-color brioche (and switching color dominance), lace work and ends with two-color lace brioche with baubles. Phew! 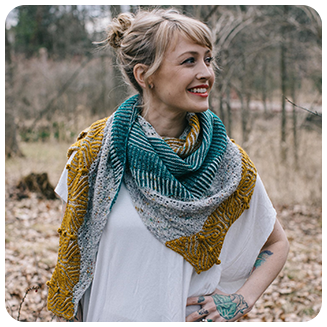 Let Pam Grushkin lead you through this incredible shawl/wrap/scarf/neck candy and prepare to wow your family and friends! This is a new group with an instructor who is anything but new to our store. This group is the perfect spot for you if you’re looking to take your (advanced beginner or intermediate) skills to the next level. Jane will help you with your WIPs (works in progress), as well as help you tackle projects may have seemed too intimidating to attempt on your own. You’ll learn techniques and practical skills that build on your current basic knowledge of knitting in a way that only Jane can explain. Jane’s career as an educator, combined with her passion for design, puts her in the rare position of being a “knitting mentor” you’ll come to value enormously. ​Do you know how to knit and purl, but want to expand your skills? “Building Blocks is a skill building class that has students knitting a different 12″ block every month that can be pieced together to create a lovely sampler afghan. Pam will guide you through the various stitches and techniques each month as your knitting knowledge is increased. With a different skill focus each month there is something new to learn at each class. Topics such as gauge, cast ons, bind offs, cables, increases, decreases, lace, pattern reading and more are covered. This incredibly striking sampler afghan is the perfect way to learn different stitches and techniques that make up the mystical world of colorwork! 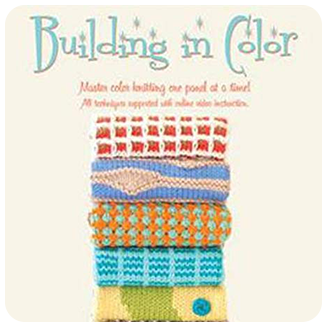 Over the course of the class, you will gain confidence managing several colors at a time while knitting ten different panels: intarsia, short rows, slipped stitches, knit below, elongated stitches, mosaic, tuck stitch, and the butterfly stitch. After the panels are knit, you will learn how to finish the afghan by blocking and seaming the panels. The final step is knitting the border. The Breakfast club will meet the first Sunday of the month. It's a time to relax. Pam will help you with existing projects and/or give advice on new projects. Come exchange ideas and see where the time takes us. Pam's Stamford based Stitch and Chat will now have an additional group time at Westport Yarns. 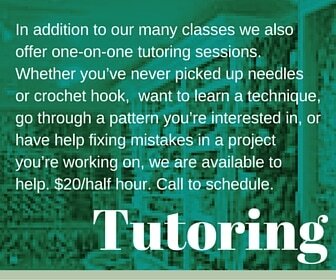 Beginners as well as more advanced knitters and crocheters are welcome. At Stitch and Chat you choose what you'd like to do: project support, learn a new technique, strengthen basic knitting skills, essential skills (follow-up to basic knitting skills), refine abilities in finishing, conquer advanced methods, cables, and pattern stitches. ​Are you confused, frustrated, overwhelmed? Do you drop stitches at a whim? Are you in need of help? The answer to all your knitting questions are in this knit group with Laura. A casual group for help and inspiration for your knitting, crochet or weaving concerns. Come for help and guidance from Laura and enjoy in the camaraderie. We offer a variety of classes that range from techniques to full projects. And projects can be everything from a simple sock on 4 needles to a sweater coat. While we carry the perennial favorites throughout the year (socks, continental knitting) we add new classes every season. Students must register for all classes. Payment must be made at time of registration. Classes are non-refundable and there are no make-ups for missed sessions. If Westport Yarns must cancel a scheduled class, students will receive a full refund. Unless noted - class fees do not include materials or patterns. Any yarn, tools, or notions purchased for your class at Westport Yarns will receive a 10% discount.